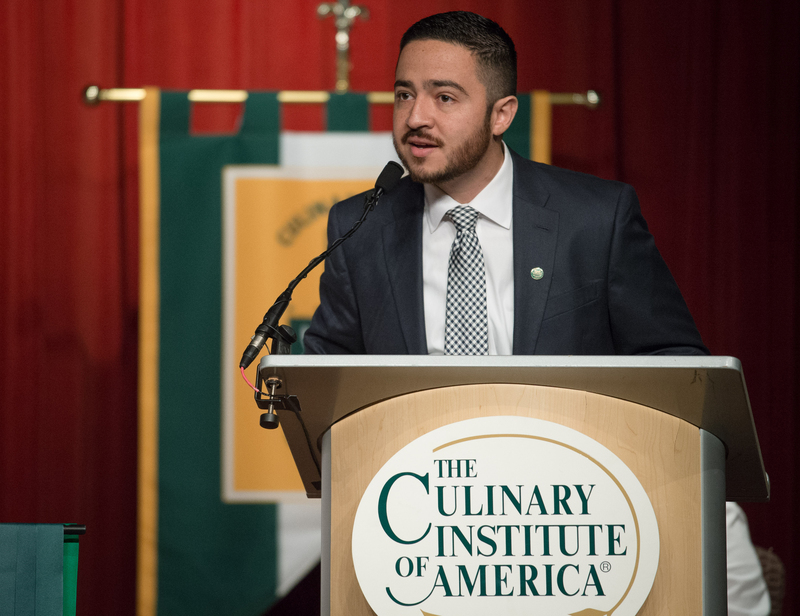 San Antonio, TX – Diego Galicia, chef and co-owner of Restaurant Mixtli and Mezcalería Mixtli in San Antonio, spoke to graduates of The Culinary Institute of America on December 18. Chef Galicia challenged the associate degree recipients to take care of each other—and themselves. Chef Galicia reminded graduates that they are entering a life of service and commitment to others. He advised them to take care of their own health, as well as their feet and their knives, and to continue to polish their craft. While completing his studies in Latin Cuisines from the CIA, the native of Toluca, Mexico was named chef de partie for the opening of Restaurant Lüke in San Antonio, working with CIA alumni Steven McHugh ’97. He was corporate chef for the Taco Cabana chain before making a major change from the quick-service segment with the opening of Mixtli in 2013. Serving only 12 guests a night, Mixtli is one of the most sought-after reservations in San Antonio. It was named one of the 10 hottest restaurants in the city by Zagat Survey and one of the 10 most romantic restaurants in America by USA Today. Mezcalería Mixtli, focusing on mezcal and other Mexican spirits, opened earlier this year.